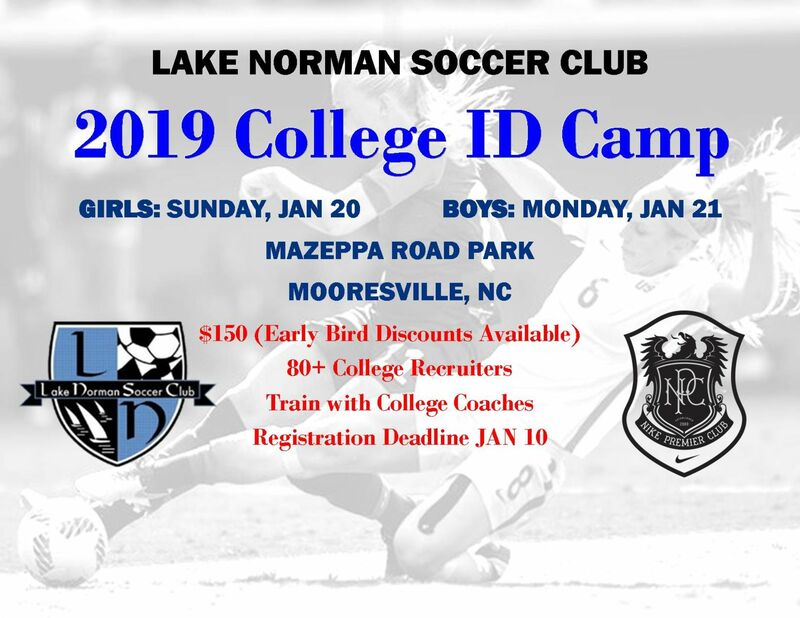 Welcome to the 6th annual Lake Norman Soccer Club College ID Camp. Hosted at the beautiful Mazeppa Soccer Complex, we have access to both turf and grass to deal with potential weather conflicts and adjust accordingly. Players are guaranteed maximum possible game-time in small rosters in both small sided matches and 11 v 11 matches in front of college coaches. We provide all attending college coaches profiles on attending players so they can contact you accordingly. The ID Camp has hit capacity every year since its inception, please register early to reserve your spot. REGISTRATION Closes January 14, 2019 or when capacity is met. Others will be waitlisted. Payment can be made online by credit card at the time of registration. If you choose to mail the payment, applications are not considered complete until payment is received. Checks can be mailed to 542 Williamson Road, Suite 4, Mooresville, NC 28117. Please include "College ID Camp" and participant's name in the memo field. PAYMENTS ARE NON-REFUNDABLE OUTSIDE OF EVENT CANCELLATION. Where: Mazeppa Soccer Complex, 645 Mazeppa Rd. Mooresville, NC 28115 - both turf and grass fields. 9-10am- Arrive at Mazeppa Road Park and Sign in. Players will receive ID Camp t-shirt to be worn during camp.